Shellfish and toxicology experts with the Washington State Department of Health are rushing to test new samples of geoducks from Poverty Bay near Federal Way. Poverty Bay is the apparent source of the geoducks that triggered a Chinese ban on the imports of all bivalves from the U.S. West Coast. Since I wrote about this issue in Water Ways last Tuesday, state health officials have learned that arsenic — not paralytic shellfish poison — was cited by Chinese health officials as the cause of their concern in the Poverty Bay geoducks. Past studies by state researchers have concluded that arsenic is not a health concern in shellfish taken from Puget Sound, based on sampling from some of the most polluted bays in the region. A letter (PDF 118 kb) sent last week from the U.S. Seafood Inspection Program to China’s health officials calls for China to lift its unusual ban. The letter cites a 2007 health assessment on arsenic in geoducks from Poverty Bay, where the giant clams were deemed safe to eat. As a precaution, Washington Department of Natural Resources has closed the 135-acre Redondo Tract in Poverty Bay to shellfish harvesting until the Chinese ban can be resolved, according to a statement issued Friday from Public Lands Commissioner Peter Goldmark. One of the complicating factors in dealing with arsenic in shellfish is that the organic forms (primarily arsenobetaine) are not toxic, yet they are far more prevalent than the toxic inorganic forms (arsenic III and arsenic V ). It is far easier to measure total arsenic than to separate organic from inorganic forms, so researchers often make assumptions. To be extra safe, they have assumed for years that toxic inorganic arsenic is less than 10 percent of total arsenic. Now, they have begun to rely on more recent geoduck studies from Seattle’s Richmond Beach (PDF 327 kb) that showed the inorganic form of arsenic to be less than 1 percent of total arsenic. Dave McBride, a toxicologist with Washington’s Department of Health, told me the Chinese were reporting levels of arsenic at 1.7 parts per million, but they failed to say whether that was total arsenic or inorganic arsenic. The Chinese health limit was reported as 0.5 parts per million inorganic arsenic. 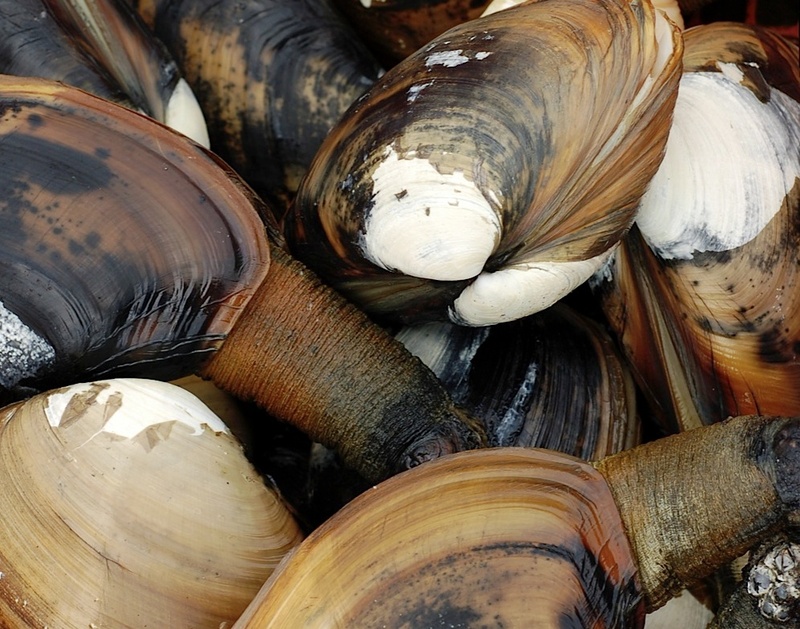 It also makes a difference whether the whole geoduck was tested or just the edible parts. The skin, which is generally discarded when cooking, appears to concentrate more arsenic than other parts, but the levels still are not high enough to be a concern. A 2002 study of shellfish from several polluted water bodies in Puget Sound (PDF 1.5 mb) found levels of inorganic arsenic in clams to fall in a range from 0.015 to 0.035 parts per million. A 2007 health assessment of geoducks from Poverty Bay (PDF 874 kb) found total arsenic levels ranging from 2.28 of 4.96 parts per million. Assuming inorganic arsenic at 1 percent of total arsenic the maximum value is .05 parts per million for shellfish from Poverty Bay. That’s one-tenth the level of concern reported by the Chinese. Initially, Poverty Bay was an issue because of two sewage outfalls in the area and the proximity to Tacoma’s former ASARCO smelter — even though most airborne pollution landing on the water gets well dispersed. But the formal health assessment allayed concerns about arsenic and other metals as well. Arsenic always raises initial concerns, because its inorganic form is known to disrupt the metabolism of multi-celled organisms, including humans. Also, it has been known to cause cancer. Because inorganic arsenic levels in shellfish are normally low, no federal or state standards have been established. In response to the Chinese ban, the Department of Natural Resources went out yesterday and collected new geoduck samples from Poverty Bay. The idea will be to present findings on both total arsenic and inorganic arsenic, thanks to more sophisticated analytical equipment at the Department of Health laboratory. Three geoducks will be put together to create a composite sample. In all, two composite samples each will be associated with 12 different locations in the bay, according to McBride. Edible geoduck tissue will be separated from the “gutball,” which may be prepared by some Chinese cooks, I’m told. If enough samples are available, the whole geoduck (minus the shell) may be tested as well, or possibly just the skin. One long day of processing is planned for Thursday, and the samples will be run through analytical equipment over the weekend, McBride told me. A report on the findings can be expected next week. For information about the China ban on shellfish, check out a fact sheet from the state’s Office of Shellfish and Water Protection (PDF 282 kb).